Chelsea, the birthday party dog, is celebrating her sweet sixteen birthday. You would never know it. She still had boundless energy and looked like a puppy. Her coat was black with very few white hairs. 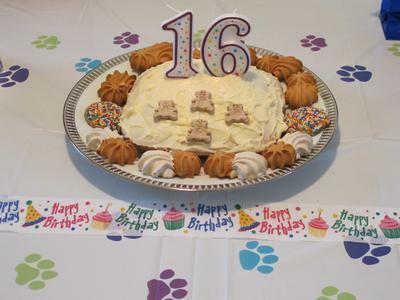 Chelsea's mom made a dog birthday cake using the dog cake mix from K9Cakery.com. If you are a doting dog mom, you can see that you are not alone. Chelsea's mom, Donna, decorated the table with a paw print tablecloth. Big number candles adorn the cake. Will Chelsea blow them out? Let's see the other photos of the big day! The table is set and the birthday girl is posing for her birthday picture. Her mom has matching plates and cups for the guests. (Presumably these will be the human guests drinking out of the cups.) But what a fun idea to go all out for your dog. Many people consider their pet to be part of the family and would have no reservation doing the same. When do we eat the cake? Poor Chelsea. All dressed up for her birthday. And there she is, posing...with that delicious dog birthday cake sitting right under her nose! As you can see, her little brother climbed up in the chair to get closer to the cake too! You can almost hear her calling: Mom. Mom! Can we eat the cake now? Yay! Dog birthday cake! It was worth the wait! Finally. Chelsea and her little brother get to enjoy a piece of cake. There were presents on the table. Wonder what Chelsea got for her birthday. Maybe a new squeaky toy. We don't know who blew the candles out. Or even if the candles were lit. 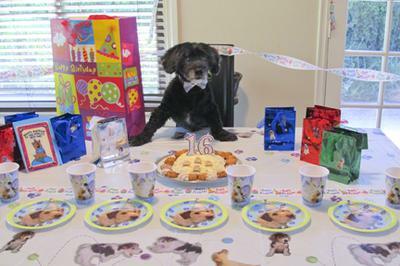 But a sweet sixteen party for a dog is truly a special event. Don't be shy. And don't think that anyone will find you strange. 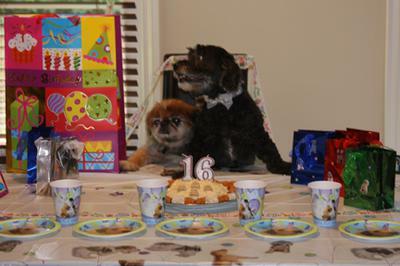 More and more people are celebrating their pets' birthdays. 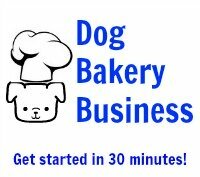 If you don't know your dog's birthday, give him one - he won't challenge you for it. 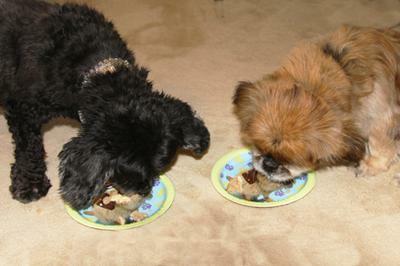 Shelter dogs are given the birthday August 1. August is a good month to celebrate a dog's birthday. There aren't any national holidays and it makes a good excuse to have a party! Invite a few well-behaved guests. 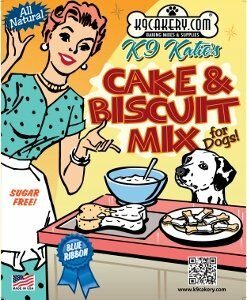 Bake a cake using K9Cakery's dog cake mix, and you're set. Of course you will want to offer the humans some dessert as well.